TUESDAY MORNING, APRIL 24, 10:30 AM Sisterhood is once again hosting a Gurwin Nail Salon for residents of the nursing home. Please join us and make a senior's day! Contact Jennifer McHugh through the synagogue office for more information. 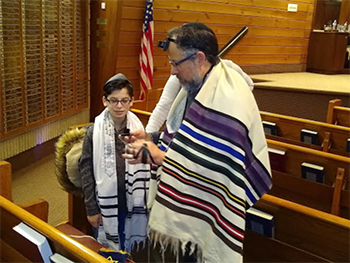 Please join us for a play compiled and edited by Rabbi Ian and Lisa Green, "If Shoah Scrolls Could Talk," the saga of two rescued Holocaust scrolls from Kolin and a neighboring Czech town, and the escape from the maelstrom of the Shoah as recalled by a Kolin survivor. WEDNESDAY, MAY 1 at 7:00 pm. 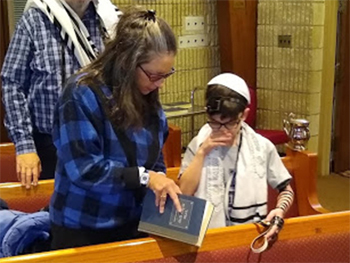 Derekh eretz is the code of behavior that binds us to each other as human beings and as Jews. It means acting decorously and with respect toward all. 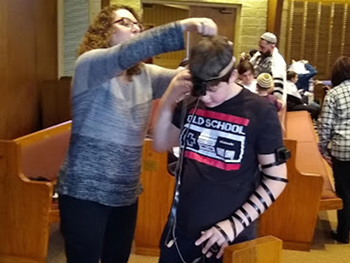 Students explore the development of morality as a key component to holiness and how it becomes a fundamental value in Judaism in the contexts of governing, wisdom, emotional balance, sexual and gender matters, public debate and more. 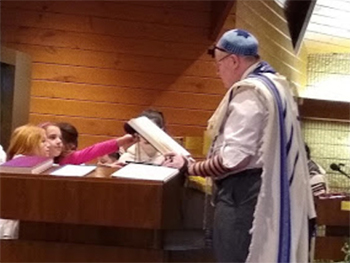 Classes meet Thursday evenings, from 7:15 until minyan. Classes: 4/11, 5/9, 5/23, 6/6, 6/20. Why apples and why honey at Rosh Hashanah? Why apples and why honey at Rosh Hashanah, and not bananas or pears, since they too are sweet? A myriad of reasons accompany the ancient tradition of eating apples and honey. One reason is that the apple ripens just at this time and is at its maximum sweetness. Honey is also coming into its own very strongly at this time of year. At the same time though, apples have a tartness to them, even while they are sweet; and honey, while at once sweet, brings with it the honey bee, which can sting. These dualities reflect the real notion that not every day will be sweet. Some days may be bitter and perhaps biting. We must, therefore, attribute both the good and the bad to God and seek to find some aspect of holiness in even those bitter moments. The apple tree is viewed by King Solomon as exemplary and unique. “Ke tapuch al Hazedeh ken rahayati–as an apple tree in the field is my lover, singular and noted,” he writes in Song of Songs, and so we hope that the Jewish people will achieve a similar status of singularity and noteworthiness. And in the Jewish tradition, an apple tree is connected to the love and intimacy of married partners. Even on Passover, we eat charoset, with apple as its main ingredient, to remember the commitment of a husband and wife to one another, and that they may seek to produce families, even in times of challenge and suffering. As an example, under Egyptian slavery, Jews would sneak away at night from their taskmasters, who sought to disrupt their married life, to find intimacy with their partners. Dr. Gil Yosef Shachar, drawing upon the ideas of Hebrew University Renaissance professor Yael Evans, mentions some other reasons why we bring in the new year with an apple. The apple tree is an extremely efficient tree. It has relatively few leaves, given the abundance of its fruit. It provides little shade as a result, but still optimizes the production of fruit by generating energy through photosynthesis. In fact, apples begin to bud even before the leaves come out. This, too, is an excellent explanation of a good year–a year of productivity and yield with a minimum amount of time and energy expended. A kindergarten teacher taught me that if you cut an apple in half, you will see a five-pointed star. This is to remember the Divine promise that Israel will be as numerous and vibrant as the stars if we enact the five points of the Teshuva of Repentence: realization, regret, admission of sin, formally asking for forgiveness from those we wrong, and resolving to never give in to temptation when it presents itself. As we dip the apple in honey this year and say the Bracha, may we be mindful of these many avenues of goodness and sweetness, blessing and success, that relate to apples and honey in this coming year. My family and I wish you and yours a Shana Tova u’Metukah–a sweet and healthy New Year!